I write for a number of evangelical organizations and speak around the nation about the need for disciple-making and leadership development in the local church. Below are some of the fun projects I've worked on over the last few years. It often seems like trained church leaders have a secret skill that can leave the rest of us wondering "How did he do that?" 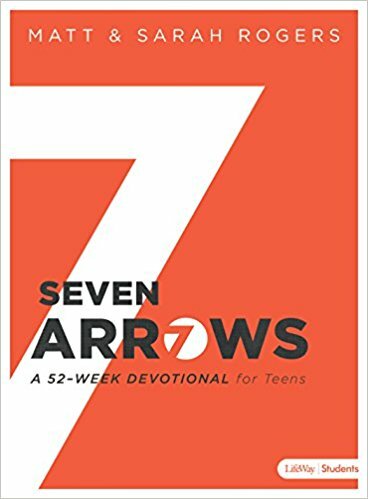 Matt Rogers and Donny Mathis wrote Seven Arrows to aid all of God’s people in the task of reading, understanding, and applying God’s Word. Using seven simple arrows you will find a clear, orderly, and memorable guide for studying any Biblical passage. This practical devotional guide for students provides a 52-week survey of the overarching story of the Bible, uniting all of Scripture to the person and work of Christ. Using the arrows as a guide, you'll move through the entire Bible in a year and emerge with a deeper appreciation for God's love for you and the beauty and power of His Word. Aspire is a 15-week study, written in two parts, designed to be used to disciple believers in the local church. Each week's study combines rich theological content and clear practical application in a journal-based format. Ideal for one-on-one discipleship relationships, Aspire guides believers toward life-long transformation. In an age of church splits, what might happen if churches could work together? Mergers is a guide for how church plants and existing churches can and should consider merging together for the sake of mission to the city. The book outlines Matt's process of merging Covenant Grace Baptist Church and Renewal Church in Greenville, SC and is meant to provide encouragement and tools for other churches to consider doing the same. In Unite, seasoned and younger leaders (ranging from a few years to a few dozen years of ministry) have partnered together to exhort other leaders toward inter-generational unity. The voices in this volume write as practitioners who have demonstrated a heart for partnership and a model of such unity in their ministry contexts. They write in hopes that leaders will move out of isolation and take intentional steps towards unity that we might see the Great Commission fulfilled in our day. The seminary classroom and the pastor's desk stand on either side of a deep chasm. Whether you've been to seminary, read a few books, or just have a burning passion to serve God's church, you will quickly realize that the task of pastoral ministry is more overwhelming than most assume. And one of these daunting practical demands of pastoral ministry is teaching church members to do the seemingly simple task of reading their Bibles well. Money. It nags for the attention of every pastor, particularly consuming the focus of the church planter. Money is far more than a necessary evil for the church; God uses it as a vital conduit to accomplish his mission. With it, we plant churches, send missionaries, fund staffing, and run the various ministries of the church. Though we may feel a bit less-than-spiritual in admitting it, money is essential for the work to which God has called us. The goal of this short book is to aid church planters, missionaries, city mission strategists, denominational leaders, and established church pastors in raising the funds needed to fulfill their God-given vision. In this version of Pastor's Notes, you will find a step-by-step process for fundraising designed with the church in mind. I’m committed to work to help people read and understand God’s word for themselves and, for that reason, I decided to write 30 Days to Deuteronomy. I love the book of Deuteronomy because it provides one the most vivid pictures of the grace of God found in the Bible. The themes of the book illuminate the work of Jesus like none other. In it, you will see your sin and God’s love in fresh and new ways. Download a free sample at TheJesusBible.com. Following the model of Paul and Timothy, Next seeks to provide a biblical foundation and practical guidance for training the next generation of believers. Writing a Church Planting Prospectus: Free downloadable examples.